Through user-focused approach, we at Adroitte provide innovative web solutions that revolve around UI/UX designs, simplified navigations, application integration, cross-channel compatibility, SEO and conclusively performance optimization. Adroitte is an Award winning Web design & Development Company recognized by Siliconindia as one of the Top 25 best service providers from Bangalore. Google Adwords certification deals with acknowledging individuals or organization for their efficiency in online Advertising. Google Adwords certification concentrates on PPC methodology for generating better ROI. 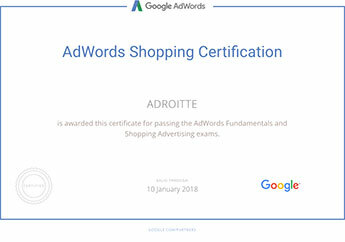 Proud to say that, Adroitte is a Google recognized Adwords certified professional. Be a better marketer, is the motto behind Google’s Analytics certification. Through earning this certificate, an individual can easily interpret the behavior of potential visitors and enhance the professional competency. 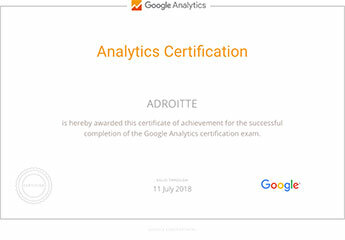 A Google Analytics certification holder, Adroitte has a better leverage in deriving the behavior of market for driving extensive web traffic.